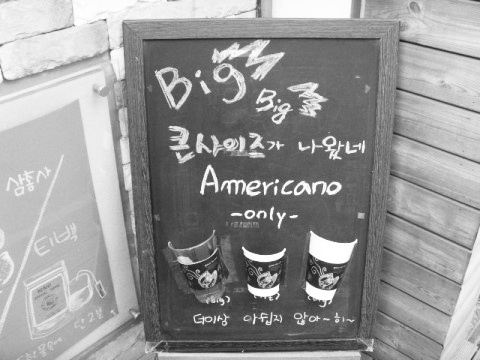 ▲ In a Korean sentence, the English word “size ” is written in Korean alphabets following the English pronounciation. Globalization through modern technologies creates new lifestyles and brings cultures closer to each other. Language also cannot be of an exception in the face of this new and huge wave. In our daily life, we can notice that we frequently speak and write foreign words. People have even started to use foreign words without realizing this, and this general trend is becoming a part of our lives. But, is this life style of using foreign words in daily life instead of Korean words good? Here is the story of daily life example. How many foreign words, not Korean, were used in this conversation? If you were a native English speaker with no experience in Korea, you could probably answer just two words, grande and arbeit. “Grande” is Spanish and “arbeit” is German which means “huge” and “working”, respectively. If you have any experience of living in Korea you will probably notice more than five words; café, coffee, ice, spec and internship. And if you were Korean and read this conversation very carefully, you would say there are too many English words. It is because more than one foreign word was used in every single sentence; size, small, medium, large, grande, bell, and group study etc. Koreans truly use a lot of foreign words in daily life. Is this situation good? Doesn’t this situation have any problems? He also added that mother language has more benefit for native speakers because words consist of prefix and suffix. Usually, native speakers learn prefix and suffix naturally and many words are made of mixing prefix or suffix. This experience makes a huge difference in using the language with experience. The knowledge of prefix and suffix helps to guess the meaning of a word when we hear the word for the first time. For example, in English, the prefixes such as dis- or un- make it possible for people to guess that they give words opposite meanings from the original words. The same thing happens in Korean too. For example, “Nam,” which means south in Korean, helps people to guess certain words are connected with South. When “Nam” is used as suffix and prefix in words such as Gangnam and Namhan which mean southern part from river and South Korea. In addition, many people need to participate in using our pure native Korean. Korean words which people use nowadays are so different from originals by Chinese words and characters. As he mentioned, trying to speak in our own words is important and meaningful. In the past, the Korean peninsula was invaded a lot by foreign nations not only by Japan and China but also France, England and others. Koreans could have remained as a Korean because they reserved their language and culture. This is the critical moment to continue our tradition as well.